Whether managing all systems in a building, or managing one system across several buildings, EBM enhances the ability to manage energy consumption. In large organizations there are control systems that manage building functions, and there are enterprise systems used to manage operations. Usually these two types of systems are not integrated. Each has much to offer the other, but they rarely intermingle. Information systems, such as SAP and Oracle, help manage resources, supply chains, and relationships with the enterprise's stakeholders and clients. They cover management decisions and actions requiring information. The objective is to gather data from disparate systems and deliver it as useful information. This requires information to be normalized for meaningful correlations. Building controls include HVAC controls, sensors, meters, fire alarms, access control etc. Enterprise systems include financial software, Capacity Requirements Planning (CRP), Enterprise Resource Planning (ERP), Facility scheduling, load profile models, power purchasing and asset management. There are major integration challenges even within building controls, Various building level systems just don’t inherently communicate. Intelligence has ended up scattered across disparate networks of sensors, logic and actuators. Badge readers don’t talk to chillers, which don’t talk to elevator controllers, which don’t talk to surveillance cameras. Alarms, video and other data may be consolidated to show up on a shared console, but that’s only a small step forward. It’s common to see energy use profiles generated from data collected with energy monitoring systems, but it’s very uncommon to have an analysis solution that includes information about the physical operation, the day-to-day operation that caused the energy profile. Managers end up studying the data resulting from energy consumption, not the root causes of energy consumption. The global market for building data integration technologies continues to grow as vendors begin to understand and develop solutions that process large amounts of facility data. Today, the challenge lies in organizing data sets that come with various formats, naming conventions, and syntaxes. 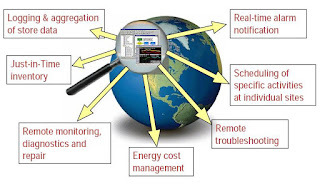 While new building energy management systems (BEMSs) can be implemented to enhance data collection and processing, existing systems present challenges in performing functional data analyses. Building Integration - Making diverse systems in multi-building and campus environments communicate Best example is the public sector Campus built over time systems installed by lowest bidder Results in – multiple systems that do not communicate. EBM – Enterprise Building Management - Bridges the gulf between the business and operational layers of the enterprise. Font end for performing advanced data analytics, data aggregation, data archiving, fault detection and fault diagnostics on building automation information across the enterprise. Facility Master System Integrators - Performance contractors who need to be hired and managed as if they are IT contractors. EUI's - Energy Use Indices -Such as kilowatt hours used per square foot (kWh/SF) can be compared between similar buildings to gauge if any particular building is using more energy than necessary. EUIs can also be compared to previous data to ascertain if a particular building’s energy usage has increased. Since equipment efficiency tends to decrease over time, observations of energy usage can indicate when equipment is in need of service or replacement. FDD – Fault Detection and Diagnostics – Data analytics capable of crunching hundreds of thousands of points from the now-integrated enterprise into understandable and manageable action items. These analytics can be quickly applied to the BAS system in order to begin optimizing it. For example, FDDs can generate a report of all the zones, in the portfolio, which are unoccupied and yet receiving conditioned air. XML For multi-building developments — whether that means university campuses, government buildings, medical centers or corporations with buildings scattered in various locations — XML may offer a way to manage operations and share important data via Web services over the Internet or campus intranet system. Fully integrated BEMSs can process data from building systems, the grid, and weather information to provide actionable insights and improve facilities management. According to a 1Q16 research report from Navigant Research, global building data integration revenue is expected to grow from $89.9 million in 2016 to $971.3 million in 2025. Multi building owners have a huge maintenance problem. They are looking for an Internet friendly, real-time, loosely coupled, peer-to-peer integration framework that bridges the gap between the business layer and the operational layer of the enterprise. Back office data systems, accounting, email, HR, aggregated energy reporting, real-time utility pricing, hotel guest service systems, continuous commissioning. Large Enterprises - Typically serve the needs of a huge number of people and comprise a large variety and number of buildings within their respective real estate portfolios. Large enterprises also face pressure to reduce cost while increasing service levels. Data Centers - Without 24/7 awareness of the physical environment, data centers, and the enterprise that depends on it, are at risk. While cooling, power and security systems often operate outside the standards set by I.T and protocols like Modbus, LON and BACnet, are not within the standards set by IT, EBM can provide an integrated operating picture of operations. Healthcare - Hospitals often operate with gross inefficiencies, un-integrated systems, no enterprise network and poor diagnostic tools. The main reason for this lack of visibility is that there is typically little or no integration between the various systems in the hospital. In addition to standard interfaces, hospital systems typically also include Patient Tracking, Nurse Call, Medical Gas, Mobile Refrigerated Case, Asset Management and Human Resources systems. Space management dynamics of a hospital make it impossible to effectively manage energy and building operating expenses at the building systems level. Regulators demand compliance from hospitals via patient-safety reporting measures such as JHACO. Analyze historical and near real-time energy consumption and demand by site. Managed Capital Costs – EBM give building owners tools to understand which building systems to change and would it be cost effective to do so. Visibility – EBM provides executives and management easily understood information related to the energy efficiency of their facilities and helps to identify how well buildings are performing overall with respect to commissioned state of systems and maintenance activities. The introduction of a web browser interface allows a user to access and view resources. Users can dramatically enhance their ability to manage a facility by networking the BAS’s for multiple buildings so that they can be controlled from one location through the internet. Integration allows energy information to be elevated to the management level, increasing usefulness. Share Information - Simply stated: Data is Valuable. Aggregated data is compounded value. Sharing building and energy data empowers decision making. EBM eliminates silos of systems. Proactive Maintenance - EBM reduces maintenance costs and changes the way asset management works. Instead of reacting to failures, an enterprise can be proactive about maintenance and reduce repair costs. Parts inventories can be smaller, and replacement parts can be ordered in anticipation of needed service. A simple example is replacing air filters based on the actual run time, instead of the calendar, improving HVAC performance and indoor air quality, while reducing the time and expense of needlessly changing filters. Expanding this example to a larger scale, a maintenance management system that interacts with a building control system can monitor run times and performance for all equipment. Based on real-time information, the system detects a compromised motor and submits an order for replacement parts before the motor fails. When parts are delivered, that event generates work requests, scheduling the work for the off hours. A repair technician arrives with the right parts, ready to complete the maintenance in one visit, minimizing truck rolls and costs. Reliability - EBM improves reliability by anticipating situations, allowing management to act, rather than react. Centralized Support - Moving functions to Enterprise level allows for talent in proper discipline. EBM enables connecting existing systems, to achieve new levels of centralized monitoring and control. It enables management from anywhere -- on campus, or off. As needs change, new systems can be integrated ad hoc, through Web Services, often without human intervention. When support or systems management are required, the skills are mainstream and readily available. Reduced Demand on Facilities Management Staff- The integration of building systems brings control to those who need it, reducing demand on facilities management staff. For example, a secretary uses a desktop application for conference room scheduling, audio-visual control, and temperature setpoints. For example, an employee swipes an access card to enter a building on the weekend. This activates HVAC and lighting in her space, so she is safe and comfortable. Administration accurately bills the department for use of the environmental systems. Manage Microgrids - EBM provides information to help efficiently operate energy-producing utilities on campus. For example, load modeling, combined with hourly electric tariffs and meteorological data, enable optimization of combined cycle and thermal storage systems. Compliance - EBM allows health officials to examine conditions such as indoor air quality directly, without the support of facilities management staff. Historical data establishes a visible pattern of satisfactory conditions. Education - Sensor data and other real-time information can be used in classroom activities to enhance teaching of certain subjects. A university provides a living laboratory for students whose careers will require experience with these technologies. A business professor can assign projects that use live data to develop new business models for energy purchasing. Architecture students can get practical experience with LEED verification. Engineering students can work with advanced controls. Continuous Commissioning - Energy models and construction documents are used in commissioning. They become part of the EBM system after project completion, making it possible to continuously commission a building. Actual data gathered through the life of one building becomes input for planning the next. Streamlined Business Processes - Current processes, such as metering and internal billing, can be streamlined with EBM. Energy data can be incorporated into management reports and spreadsheets, and thus included in all levels of decision making. Revealed Hidden Data, Discovering New Uses -It would be impossible to anticipate every benefit of EBM, because of the many unforeseeable ways in which data might be used. Imagine predicting, in 1993, the numerous ways in which the Internet would be used. Many envisioned online newspapers, but few imagined iTunes or Google Maps. The availability of any new resource sparks the imaginations of enterprises and entrepreneurs who match unmet needs with the newly discovered potential. Silo Building Control Systems - Each building control system is optimized for its intended purpose, the "best of breed" available at the time of purchase. The engineers who developed them applied the best practices in their applications. Each of these systems has a narrow focus of operation. A small part of an enterprise is served by each system and, as a result, a small portion of the potential value is delivered. Sharing data is not a priority for individual systems, so they have a limited amount of integration. Islanded systems make it difficult to increase functionality -- most have achieved the peak of their abilities within their narrow scope. A facilities manager might ask, "If all I have after the upgrade is a newer version what I have now, why upgrade before current systems fail?" Data Quality - Macro trends in technology are making it increasingly cost effective to instrument and collect data about the operations and energy usage of buildings. We are now awash in data and the new problem is how to make sense of it. Today most operational data has poor semantic modeling and requires a manual, labor intensive process to "map" the data before value creation can begin. Maintenance - Balancing interoperability with dependence on a single vendor. This is an especially important issue for owners of multiple buildings being developed over time such as a school district. Maintenance costs could be much higher if each location is different. Legacy - Campus built over time systems installed by lowest bidder Results in – multiple systems that do not communicate. Market Power - Lock in to single vendor. Centralized administration is nonexistent, seen as a disadvantage by vendors who prefer to lock customers into their products. Lack of Visibility – Energy bills only go to the accounting department. Not having metered information at the building level. Master Planning – Sit down with decision makers. Determine do we want to go. What are we trying to do. We have multiple building of different ages with different automation systems from different companies. Several meetings to develop master plan, what protocol will support all these buildings what information do you want out of this. Once you do the planning up front, then it becomes clear. Once all the buildings can communicate on a common factor. Come out of that how to train the people. Personnel will become more effective because they are working on one standard. Open standard scenario. Then it becomes clear what systems have to migrate. Maintenance cost will be reduced. 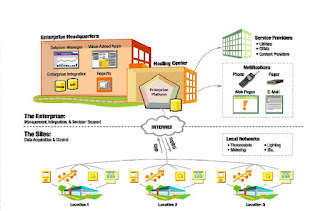 Open Architecture Gateways - Makes individual buildings easier to transfer ownership and ensure re-integration. Communication Infrastructure - Unifying BAS communication enables HMI choice. Open Standards - Enable IT to develop multi-vendor systems and networks, decreasing the cost of integration and ownership. Open Architecture – Directory enabled and discoverable, to minimize administrative overhead. Stateless, to reduce network burden, and designed to support failover measures. BuildingIQ, Rushcutters Bay, NSW, Australia & Palo Alto, CA - Their building energy management software can learn and forecast your building's energy requirements, and continuously optimize BMS settings to increase energy efficiency. BuildingIQ’s “predictive energy optimization” system, based on technology from Australian national research lab CSIRO, balances tenant comfort and energy savings by crunching weather reports, building control system data, energy pricing information, and online surveys of tenant comfort, among other sources of information. That allows the system to fine-tune building control systems with energy prices in mind. Candi Controls - Oakland, CA - A "Cloud-Assisted Network-Device Integration." They solve for interoperability by enabling data exchange between incompatible devices and services via a flexible, open translation layer at the edge of the network. Using a service bus architecture, they abstract and simplify the difficulty of multiple protocols. This has the effect of "normalizing" machine-to-machine and machine-to-cloud communications. Their streamlined Internet of Things Protocol™ ("IOTP") API allows developers and other parties to quickly realize and connect innovative services and apps to endpoint hardware, without the hassle of interpreting countless low-level protocols. Candi’s target market is service providers in the energy and telecommunications/data industries, specifically utilities, telecoms, MSOs, and the systems integrators and manufacturers associated with those industries. CBRE - Los Angeles, CA - The world’s largest real estate services company. CISCO San Jose, CA (Nasdaq: CSCO ) - A backbone of CISCO's enterprise building management initiative is the mediator technology which came through Cisco’s acquisition of a California company, Richards-Zeta Inc., in 2009. Mediator provides a centralized Internet protocol (IP)-based management of multiple systems running in a building including heating, ventilation, air conditioning, electricity, water, telephony and data. Cooper Tree Analytics - Surrey, BC - Unit of Delta Controls. One one of the largest providers of building analytics software, with offices and distributors around the world. CopperTree Analytics provides energy management and fault detection diagnostics with our Kaizen software, which delivers you the power to optimize your building performance. Cylon Controls, Dublin, Ireland US Division Cylon Energy, Manchester, NH - provides smart energy control systems for buildings and has been used in industrial, commercial, educational and medical facilities. Ecova - Spokane, WA - An energy and sustainability management company - leading building efficiency intelligence company. Helps utility providers use meter and asset data analytic-enabled approaches to dramatically scale energy efficiency savings in the commercial sector. Acquired Retroficiency in October 2015 . Retroficiency uses data to transform the manual process of identifying energy efficiency opportunities, and the resulting glut in the market that creates. Utilities, which have tens of thousands to hundreds of thousands of customers, are the key to unlocking that potential. When harnessed effectively, smart grid and smart meter data can provide deep insights about how a building is using energy and how it can improve in minutes and without ever going on site. This information can be used to target, engage, convert, and track customer energy efficiency more effectively than ever before. GridPoint, Arlington, VA. - In its first decade of existence, GridPoint raised nearly $300 million in VC funding, bought a half-dozen smaller startups -- and then ousted CEO Peter Corsell, laid off much of its staff, and more or less disappeared from view in the smart grid, EV charging and home energy analytics fields it had sought to command. At that point, many industry observers wrote it off as a has-been from the go-go green technology fundraising days of the prior decade. But in the past two years, the Arlington, Va.-based startup has raised $22 million in new funding, hired a new CEO, and rebuilt itself as a commercial building energy management player, expanding on the business it acquired when it bought startup ADMMicro. Now GridPoint has about 11,000 commercial building sites under its management, with a combination of energy monitoring hardware, portfolio management software, and a services arm to help achieve and maintain efficiency improvements for customers like big-box retail, fast-food restaurants and pharmacy chains. ICONICS Foxborough, MA - By providing a clear view of energy consumption patterns, ICONICS helps companies with their energy conservation efforts. By visualizing, aggregating and summarizing energy usage by location and forecasting energy costs over time, organizations can identify how and where to optimize consumption. Energy optimization means cost savings for the organization, reduction of carbon footprint and an increase in sustainability. Johnson Controls (NYSE: JCI) Acquired Grid Logix in 2008. Gridlogix's Automated Enterprise Management solution empowers anyone in an organization with the real time data that allows the organization to improve the facility efficiency. Lucid Design Group - Oakland, CA - Sells a software and sensor service that monitors the real-time use of electricity, natural gas and water. The sensors collect data on electricity and other resources consumed, then use a dashboard to display the amount of money both spent and saved. The company is hoping to add more of a social network component, so consumers can, say, compare their savings to their buddies online. Their Building Network Dashboard can create community-wide comparisons and facilitate real-time energy reduction competitions. Schneider Electric (ADR: SBGSY) purchased two French companies in building management in December 2010 as the race to build a suite of comprehensive suite of energy services rolls on. Vizelia provides real-time energy management software for commercial buildings, while D5X provides services to optimize how energy gets consumed in buildings. SCIenergy (SCI)- Dallas, TX - Atlanta Technology Center - Provides energy efficiency solutions via Predictive Diagnostics and Analytics for the commercial building market. The company’s suite of energy management solutions uses the industry’s first software-as-a-service (SaaS) platform to help reduce annual energy spending by comparing predicted energy and system efficiencies against real-time operation. In June 2011 SCI signed a definitive agreement to acquire Servidyne, Inc. (NASDAQ:SERV) Atlanta, GA, an energy management and demand response company, for a price of $3.50 per share in an all-cash transaction. The transaction, approved by the Boards of Directors of both companies, is expected to close on or before Q4 2011, pending Servidyne shareholder and customary regulatory approvals. Upon closing of the transaction, the combined company will take on the name SCIenergy Inc. (SCIenergy™). SCIenergy will combine Servidyne’s extensive experience in Energy Efficiency, Demand Response and Facilities Maintenance with SCI’s core competency in cloud-based energy management. Servidyne also has deep domain knowledge in Retro Commissioning (RCx), LEED for Existing Buildings (LEED-EBOM), and is the nine-time recipient of EPA’s Energy Star® Partner of the Year Award. Siemens Building Technologies (ADR NYSE: SI) Acquired Site Controls - Austin, TX - in October 2010. Site controls specialized in energy management and facilities intelligence solutions for retail chains, restaurants and bank branches. Through Site-Command Energy Management System, Michaels Stores produced a more than 25 percent drop in consumption among the retailer’s nearly 1,000stores as a result of the equipment monitoring and control and Web-based business intelligence provided by the Site-Command system. Skyfoundry - Glen Allen, VA - Provides analytics software for energy management and building systems optimization. It offers SkySpark, which allows domain experts to capture their knowledge in ‘rules’ that automatically run against collected data. The company’s analytics engine provides the ability to automatically identify issues worthy of attention. Its solution aggregates, organizes, and manages real-time and time-series data; imports data from Excel, CSV, relational databases, or oBIX; and ships with a suite of apps that allow users to manage and visualize their data using Web browser. The company offers its software for applications, including building commissioning, equipment fault detection, energy analysis, load profiling, facility benchmarking, asset performance tracking, and carbon and greenhouse gas reporting. Tridium - Richmond, VA - As of November 29, 2005, Tridium, Inc. operates as a subsidiary of Honeywell. Provides open platforms, software frameworks, automation infrastructure technology, energy management, and device-to-enterprise integration solutions for Internet of Things. It offers its solutions for building automation, energy management, security management, industrial automation, convergence retailing, medical, lighting control, maintenance repair operations, smart services, machine-to-machine, total facilities management, smart homes, and telecommunications applications. Verisae Minneapolis, MN Makes software designed to track carbon and energy consumption, to keep records detailing the company's own energy consumption. Helps measure, manage and reduce equipment and energy costs including the related business and environmental impacts of carbon emissions. The platform consists of web-enabled enterprise management solutions that improve operational efficiency, protect brand integrity and ensure regulatory compliance for distributed enterprises across multiple industries. ViaLogy, (LSE: viy) Altadena, CA - Enable real-time fusion of inputs from tens to thousands of sensors of different types. Intelligently combining multiple sensor inputs provides a more complete operational picture and reduces false positives, nuisance alarms, and missed events. Founded in 1999 as a spin-off of the Jet Propulsion Laboratories. In 2006, the company merged with its largest investor, Original Investments PLC, and became a publicly-quoted company on the London Stock Exchange's Alternative Investment Market. Viridity Energy, Conshohocken, PA, Has developed a technology platform that transforms a customer’s portfolio of buildings and energy investments into a 24/7 virtual power plant. With Viridity Energy’s guidance, facility and energy managers are able to optimize their energy use by dynamically shifting and balancing their load across a variety of energy resources such as, distributed generation and energy storage devices, in response to usage, weather and market prices. Selected as a finalist for the first Innovation Competition at GreenBeat 2009, the seminal conference on the Smart Grid.This company received an undisclosed amount of early growth funding in 1Q09 from an undisclosed investor and is likely to require further funding next year. In August 2012, Viridity raised $15 million from Japanese conglomerate and big green investor Mitsui & Co. It looks like a trans-Pacific partnership that could open up markets to both companies.The Series C round comes on top of a $14 million round in January 2011 and $10 million previously, as well as millions in state grants and investment, to bring total funds raised to about $40 million. Previous investors include Braemar Energy Ventures and Intel Capital. I have been reading many articles on the Enterprise Building Management, but found this one uniquely written. You covered almost every point over the topic. Especially I liked the point Business-Case, which included Healthcare & Hospital related inefficiencies, such as- Patient Tracking, Nurse Call, Med Gas, Mobile Refrigerated Case, Asset Management and Human Resources systems, etc. I don’t feel need to read any other article on this topic now.